Thu., May 17, 2018, 5:04 p.m.
All those Hoopfest games have paid off in a big way for Oti Gildon. After winning a national 3-on-3 title, the former Gonzaga Prep star and three of her Oregon women’s basketball teammates will play next month in the FIBA 3x3 World Cup in the Philippines. It’s been quite a year for Gildon, who returned home in March for the Spokane Regional of the NCAA Tournament. The Ducks reached the Elite Eight before falling to eventual national champion Notre Dame at the Arena. 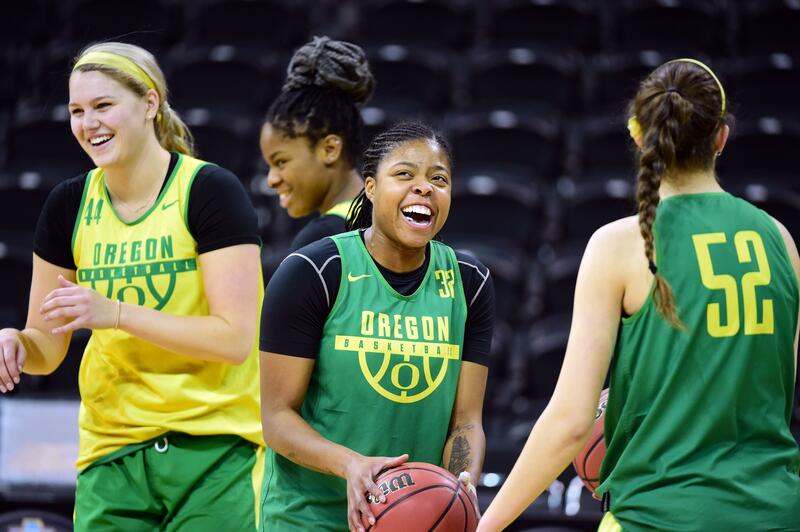 Barely a month later, Gildon teamed with fellow Ducks Erin Boley, Ruthy Hebard and Sabrina Ionescu to sweep the USA Basketball 3x3 National Championship at the U.S. Olympic Training Center in Colorado Springs, Colorado. The Ducks (8-0) cruised to a 21-5 win in the title game, beating a team comprised of former players from Temple, Liberty and Martin Methodist. Boley paced the Ducks to victory with eight points in the championship game, all from behind the arc. Hebard had six, Gildon four and Ionescu three. The rules are much like Hoopfest, where Gildon was a regular as a middle-school player before going on to G-Prep. Free throws and buckets inside the arc are worth one point and shots from beyond the arc are worth two. The first team to 21, or whichever team is ahead at the end of regulation play, is the winner. If the game ends in a tie, the first team to score two points in overtime wins. To speed up the game, 3x3 adds a 10-minute clock and 12-second shot clock. The World Cup, which will feature a men’s and women’s tournament as well as skills contests, will be held June 8-12 in Manila. Gildon, a 6-foot-1 forward, is coming off a big junior season. One of the first players off the bench, she averaged 14 minutes, 4.1 points and 3.4 rebounds. Oregon is coming off an historic season, including the Pac-12 regular-season and conference tournament titles. Ionescu was awarded Pac-12 Player of the Year and was a unanimous first-team All-American. Hebard was also a first-team All-Pac-12 selection and an honorable mention All-American. Published: May 17, 2018, 5:04 p.m.